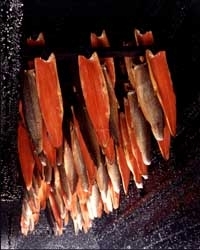 Since our award winning family smoke-house opened its doors in 1857 we have produced Scottish Smoked Salmon in the truly traditional way. Using red brick kilns dating back to the 19th century, our master smoker hangs the salmon over smoldering fires of oak-chippings. 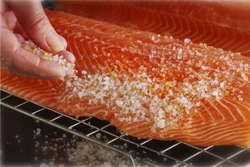 This time-honoured and rare cold smoking method produces the most succulent flavour and tender texture of smoked salmon available today. Our cure gives a luscious, rich flavour - how smoked salmon should really taste - and we have some delicious variations of smoked salmon that we have developed over the years, with infusions of cracked black pepper or Balvenie Whisky and an exquisite Scottish smoked salmon pate. Our salmon are locally sourced from the cold clear waters of sustainable farms in the Atlantic, contain no artificial flavourings or preservatives and are packed with goodness, including omega 3 fatty acids (believed to aid maintain a healthy heart).